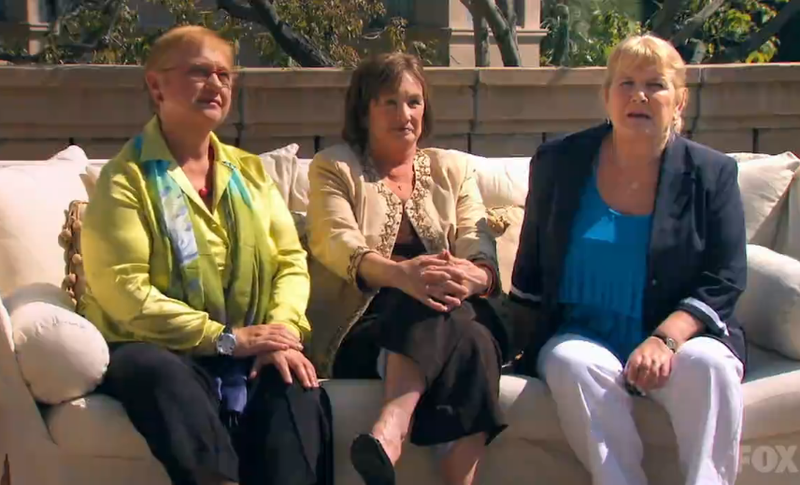 I’m sure the mothers gave more direction than that but that was all the producers decided to show the viewer. 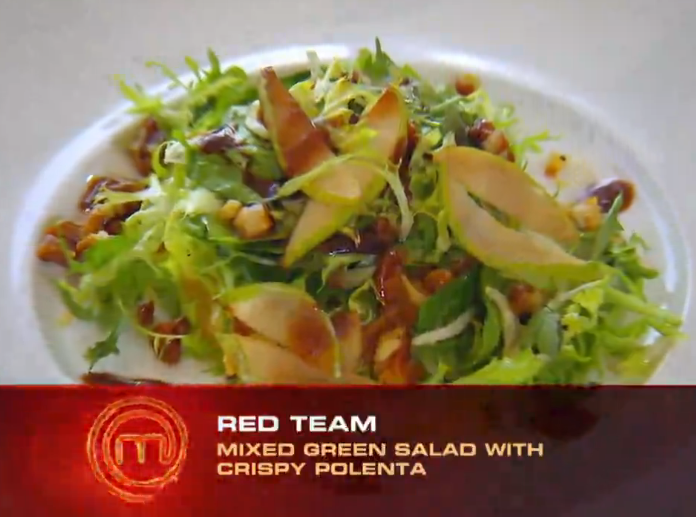 The Red Team served a Mixed Green Salad with Crispy Polenta, Spaghetti Carbonara, and Apple Pie. 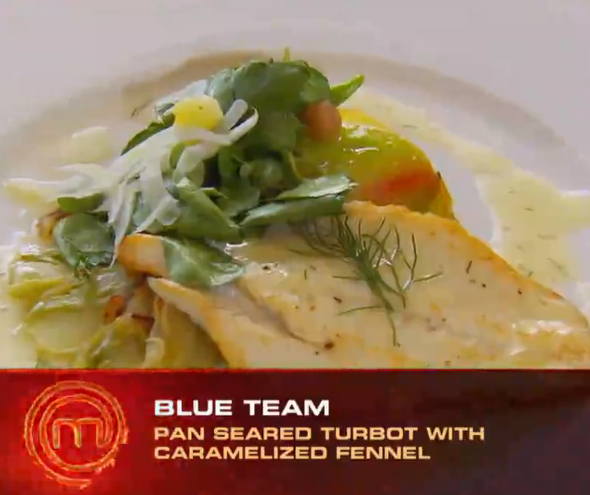 The Blue Team served Carrot Ginger Soup, Pan Seared Turbot with Caramelized Fennel, and Poached Pear with Mascarpone. Even though the Blue Team took a risk serving the fish, they served the best entree and dessert and won the overall challenge. 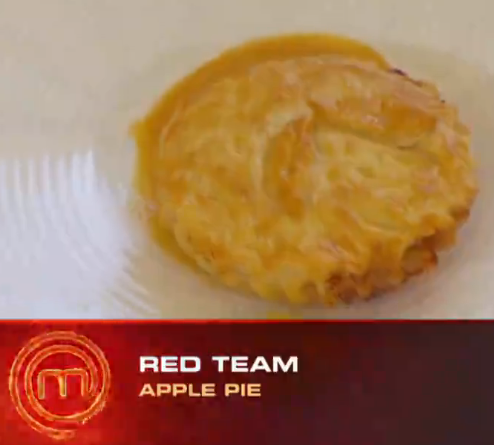 This sent the Red Team into the pressure test. 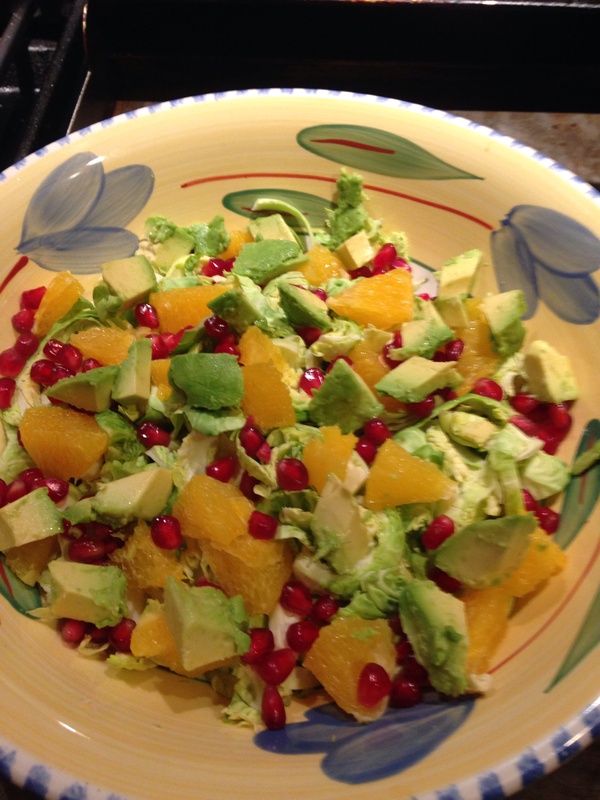 The brussel sprout salad idea came from this recipe: Brussel Sprout Pomegranate Citrus Salad. It was a decent amount of prep work (this tutorial helped with the pomegranate though) but the result was great. 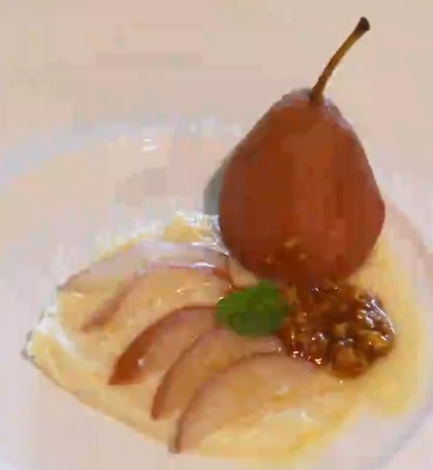 It was really fresh and light, but you have to like the texture of pomegranate seeds to enjoy the dish. For the entree, I knew that I wanted to do a fresh pasta since that was one of the few things all of the mothers seemed to like. (And I have a pretty decent recipe that I have used before on this blog). I found some nice kale and butternut squash at the store so I thought that I could incorporate that into a really nice dish. The first thing I did was roast the squash using this recipe: Simple Roasted Butternut Squash. I let it cool and then cut it into cubes. Then, I prepped the kale (using this as a tutorial since I’d never worked with it before). Next, I started to prepare the sauce. I put 6 tablespoons of butter, 4 cloves of garlic (minced) and 1/4 of a yellow onion (finely chopped) into a pan, cooking it until the onions were translucent. I then added 3/4 of a cup of white wine, 1 tablespoon of sage, 1/2 a tablespoon of thyme, salt and pepper to taste, and a splash of half-and-half. I let that all cook together for a few minutes and then added the kale into the sauce. 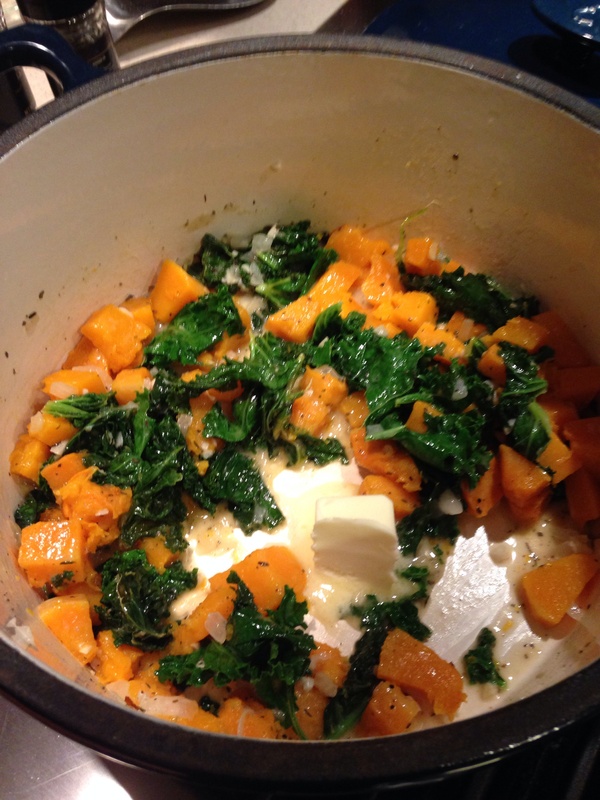 I covered this and let it cook for a few minutes until the kale cooked down. I then added in the butternut squash and pasta (once it was cooked through in boiling water), and let that cook together for a few minutes until the lamb was done. 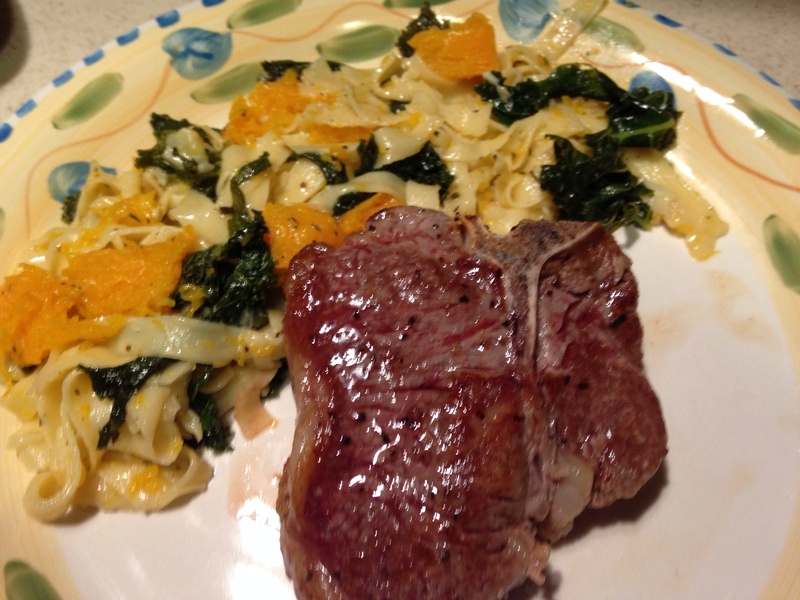 For the lamb, I simply followed this recipe: Basic Sear-Roasted Lamb Loin Chops. Overall, this dish worked really well. 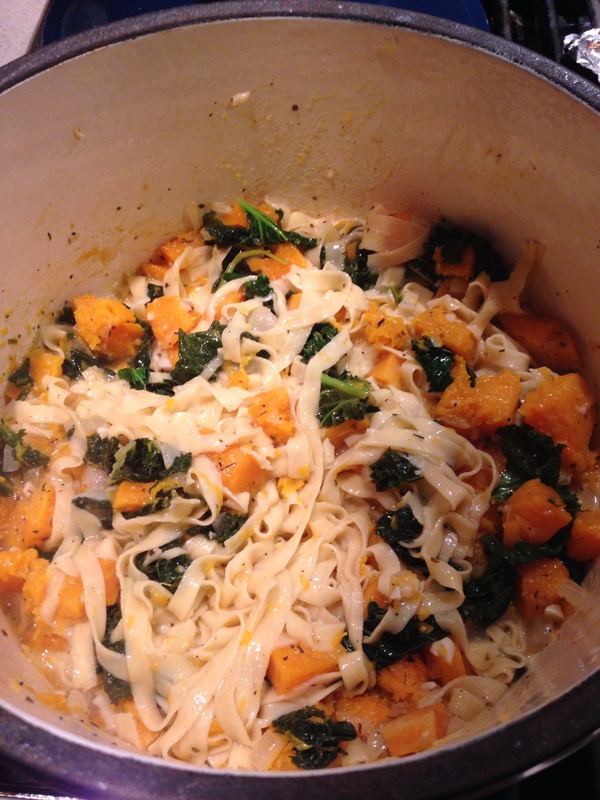 The pasta got a little overcooked and the kale was still a little chewy, but the flavors were great. The lamb was cooked perfectly and all the components tasted great together. I would definitely do this again, but I’d cook the kale before adding it into the sauce and I’d make the noodles thicker or boil them less. For dessert, I decided that I wanted to try and make beignets using this recipe: French Quarter Beignets. 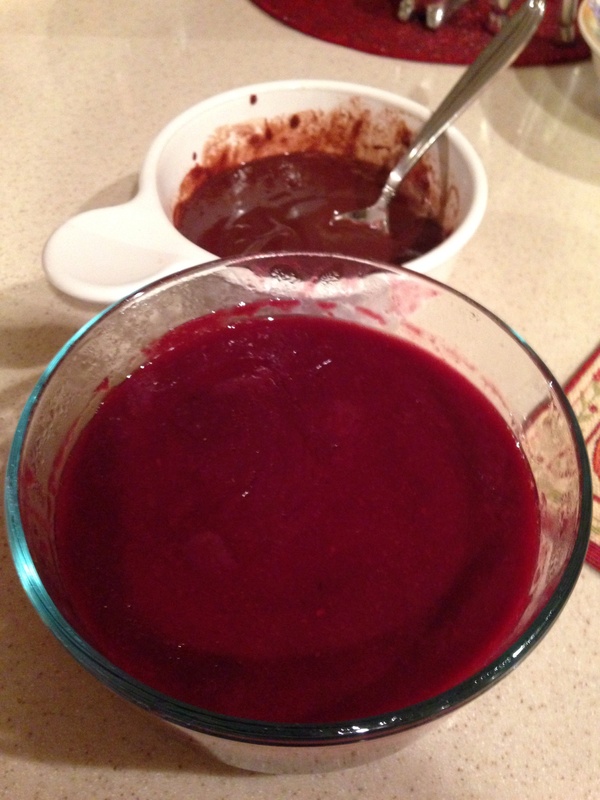 I followed the recipe completely and made Chocolate and Raspberry Dipping Sauces to go with them. I pretty much followed all of the recipes, with a couple exceptions. 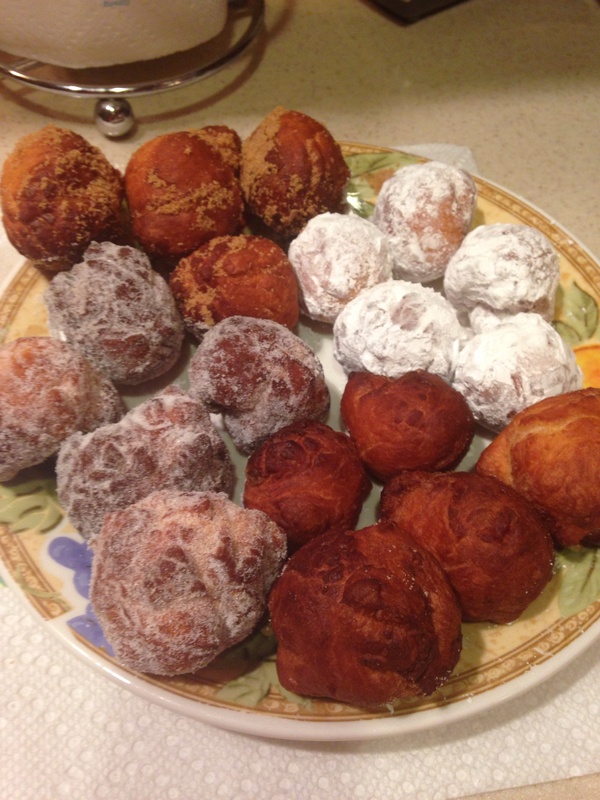 We experimented with the sugars that coated the beignets, ultimately coming up with 4 different variations: powdered sugar, granulated sugar, plain, and brown sugar with cinnamon. I also didn’t have enough raspberries for the sauce so I supplemented with blueberries and pomegranate seeds. I also used lemon juice instead of orange juice, which was great because it definitely added some more tang to the sauce. Overall, the beignets turned out great. My favorite was definitely the granulated sugar with the raspberry-blueberry-pomegranate dipping sauce, but they were all very tasty. The only thing was that the recipe made SO MANY beignets. We decided to freeze about half of them, and according to this recipe, they can be reheated by simply putting them into a 350 degree oven for 10 minutes. I have no idea how they will work out but I’ll definitely let you all know. 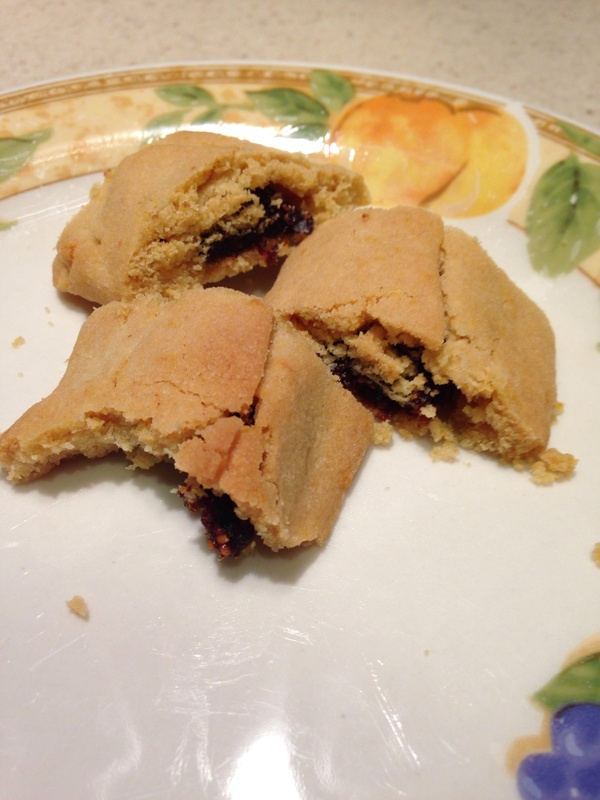 Also, as a bonus recipe, I recently tried my hand at these: Homemade Fig Newtons. They turned out great but the dough is VERY difficult to work with. While the results are great (I mean… seriously delicious! ), the hassle is probably not really worth it. Note: The Pressure Test challenge that followed this Team challenge was a repeat test: the chefs were asked to make a perfect eggs benedict in 30 minutes. 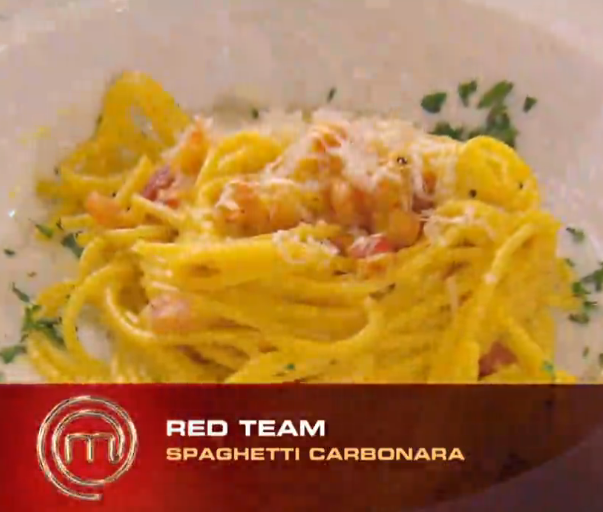 Giuseppe, Derrick and Alejandra were the chefs that had to compete in this challenge, and Giuseppe was ultimately sent home for plating severely undercooked eggs. I do not repeat challenges on this blog but here is my attempt from Season 1: S1E12 – Semi-Final 2. 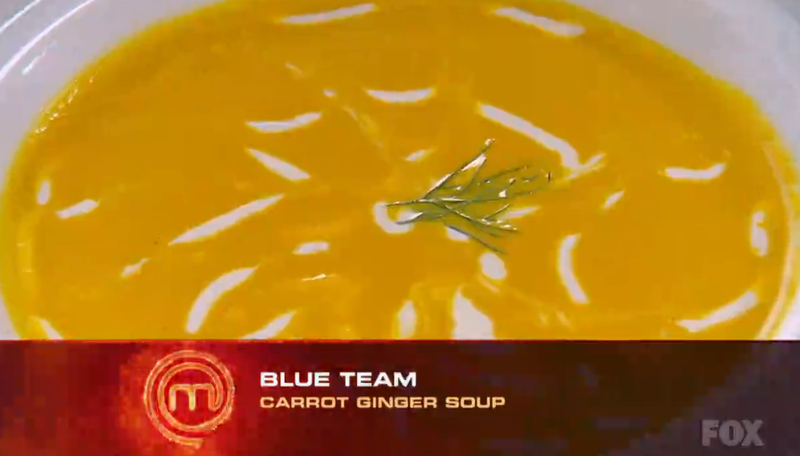 Since they lost, the blue team was put into this week’s pressure test. 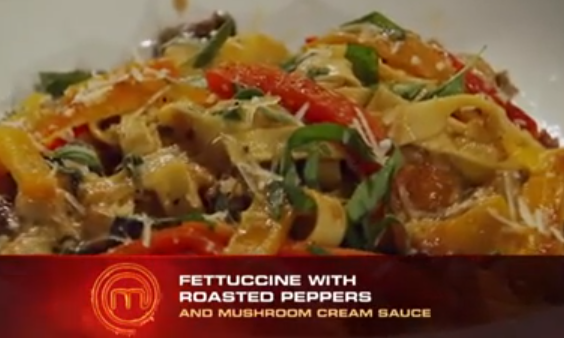 The challenge was very straightforward: make a great homemade pasta dish in 90 minutes. The twist, though, was that two people were going to be sent home. Jake (Stuffed Calamari with Marinara) and Tracey (Ravioli Bolognese) were the ones that ended up with judges’ least favorite dishes. 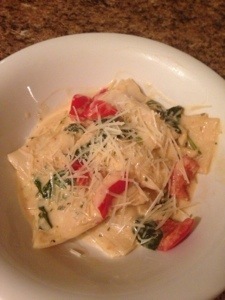 This made Lee (Roasted Eggplant Ravioli) and Mike (Fettuccine with Roasted Peppers) safe to cook another day. 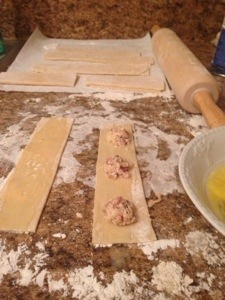 For my pasta dish, I decided to try my hand at ravioli. I’ve never made it before so I wanted to test myself. 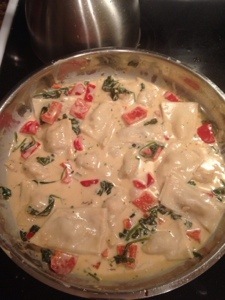 In terms of flavors, I decided on a Chicken, Pancetta and Herbed Chèvre Ravioli in a Garlic White Wine Cream Sauce with Spinach and Red Peppers. For the ravioli, I followed this recipe (just did a half version, which made 18 large ravioli): Fresh Pasta Dough for Ravioli Recipe. It worked out really great but I had to do everything by hand (due to current lack of kitchen equipment) so they didn’t look as pretty as the should have. After making the ravioli dough and letting it set, I made the filling. I cooked 3 very thin chicken breasts (cut in small pieces), 4 slices of chopped pancetta, 1/2 of a jalapeño (minced), 1/4 of an onion (chopped), 2 cloves of garlic (minced), cumin, salt, pepper, and fresh rosemary in some olive oil. When fully cooked (see below), I let the mixture cool and then put it into a food processor with 1-2 ounces of the herbed chèvre, which I mixed until it made almost a thick paste. This made twice as much filling as I needed for the dough so only use these proportions if you make the full ravioli dough recipe from above. 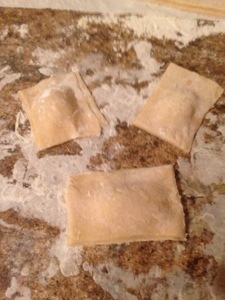 (I followed the recipe instructions for everything about the ravioli – definitely use that as your guide). To make the sauce, I used the same pan that I cooked the chicken filling in to get some of those flavors to transfer into the sauce. I sautéed 2 cloves of garlic (minced), 1/2 of a red bell pepper (chopped) and a pinch each of sage, thyme, oregano, salt and pepper in a tablespoon of butter. I added 3/4 of a cup of white wine and let that reduce by about half. Then, I added 1/2 cup of heavy cream and let that simmer until it thickened. Then, I added fresh spinach and let it wilt. As the ravioli finished cooking, I added it to the sauce as well (follow the recipe above for instructions but you basically just boil it until it floats). I let everything cook together for a few minutes and then garnished it with shredded parmesan cheese. Overall, the dish was delicious. The pasta did get a little thick in some spots, but I think it would have been fine with a pasta maker. The white wine I used also had a bit of a strong taste, which overwhelmed some of the other flavors in the sauce. But the flavors all worked well together and I definitely think I could have been in the running with this dish.